We finally got there (after lunch), and I don’t think they were what she was expecting, but she was quite taken with them, as were we all. My sister said that my fascination with them was obvious, because I stopped taking photos of my daughter, and focused instead on capturing images of these billowy creatures. She’s right. The jellies have always been my favorites – but I snagged a few Puff pics, too! 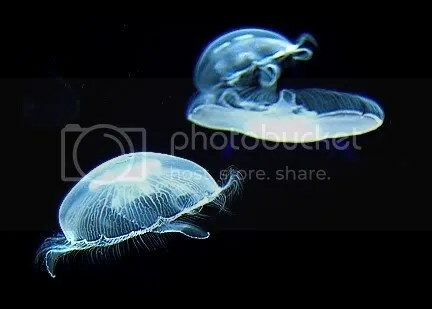 How can you NOT like the sea jellies? They’re just. . . mesmerizing. Like some kind of creepy living lava-lite. They’re graceful and beautiful and utterly devoid of any obvious intelligence whatsoever. So totally unlike anything else. . .
All of the jellyfish were awesome, and they had so many different varieties on display. Even so, it wasn’t difficult to pick a favorite among them. We all agreed unanimously that the Pacific Sea Nettles were the most fascinating of all, and we hung out by their tank for an extended period of time. 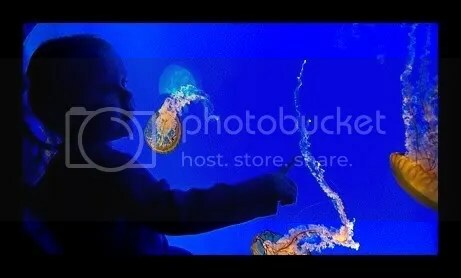 T let me know the moment we left the aquarium that she wanted to paint a picture of a jellyfish when we got home. I adore it when she requests projects, but unfortunately, I had to go to work that evening. A Puff never forgets, however, and first thing the next morning, she reminded me of our pending project. Super simple, I made an umbrella shape on a blank piece of paper and she went to town. Orange and red at her request – Pacific Sea Nettles, of course! Once she was done with painting, Puff informed me that we were to BUILD one. Now…y’all know I’m down with the arts n’ crafts scene, but I gotta admit that this threw me for a loop. How exactly does one go about BUILDING a JELLYFISH!? I had to think quickly, because Little Miss Two-Years-Old was practically tapping her foot at me. I could almost hear the theme from Jeopardy playing in the background. Then I thought about the ghosts we made for Halloween. . . It was perfect! We made the jelly in the same way, but T colored our white tissue paper by dripping orange and red dyed water onto it with a medicine dropper (again, colors by her request – she really liked those Nettle dudes). She then dug through my ribbon and string box for anything that looked right, and came up with quite a few interesting things to dangle from her jelly (and one to dangle her jelly from)! We were both pleased by how this impromptu project turned out. If you see it in person, you might say that it has a kind of beatnik feel about it! What a fun way to learn new things! You are sooo creative! 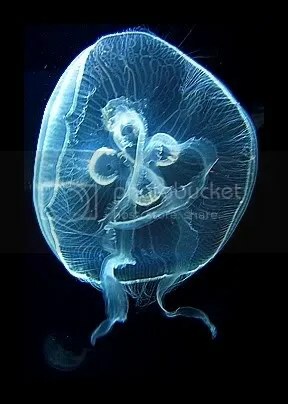 And I don’t think I have ever seen jelly fish that cool looking! 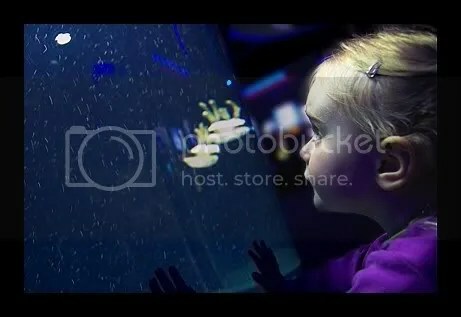 I wanna go to an aquarium! 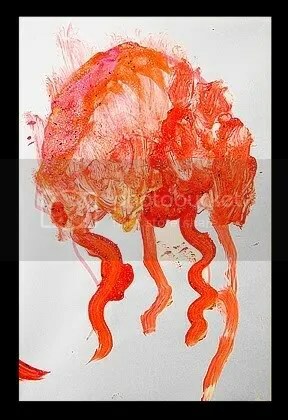 I love peanutbutter and jelly fish too!!! LOL! Lovin’ the crafts as well!! Dem jellyfish are amazing. The pics look just as good as being there, somehow. T knows toys that glow are awesome… but living things that glow are 20x cOOler. okay, I know I’ve said it before, but what a mom you are. 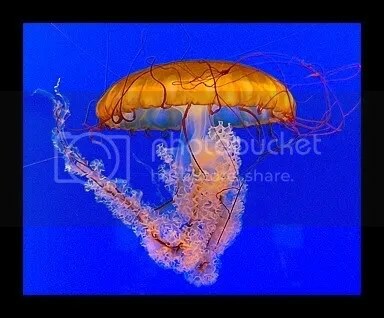 And those photos of the jellyfish are National Geographic quality!! This was unique and vivid and whimsical. Thank you for this today. Awesome!!! 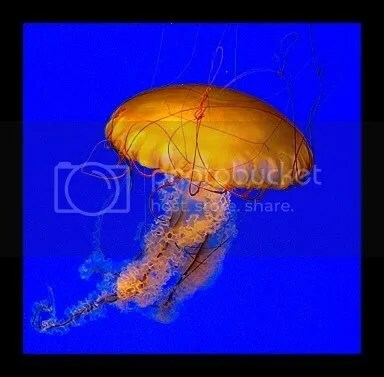 I love the jellyfish. Also my fave exhibit! You did an awesome job…okay, T did an awesome job on her jellyfish. I love them! I found you from a comment you left on Deb’s blog Talk At the Table. Gorgeous photos! Puff is a charmer and your jellies spectacular. 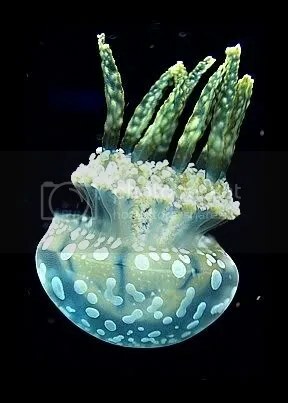 I’d never thought of jellyfish as something beautiful. As a scuba diver, they’re a potential source of distress. Although I did spend some memorable underwater moments watching a sea turtle eat one. But what I loved about this post was your creativity in showing Puff the world and helping her into the center of it. You’re both talented. I loved the painting and the ‘built’ jelly. What wonderful fun reality. 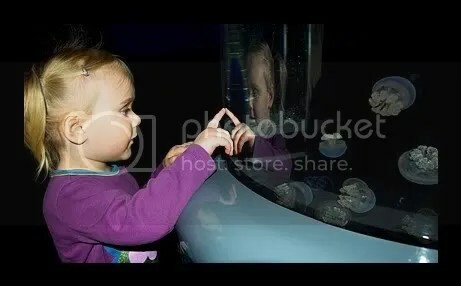 Puff won’t remember this when she’s an adult. She’ll just know that she’s always seen the world as alive in color. A wonderful gift. ‘….and utterly devoid of any obvious intelligence whatsoever.’ LOL This made me laugh right out loud. Well put! I love jellyfish, too. Peanutbutterandjellyfish…now that’s endearing, oh Puff, you’re so cute.